The cell, has many pathways to avoid a process called Apoptosis. In contrast to necrosis, which is a form of traumatic cell death that results from acute cellular injury, apoptosis, in general, confers advantages during an organism’s life cycle. For example, the differentiation of fingers and toes in a developing human embryo occurs because cells between the fingers apoptose; the result is that the digits are separate. Unlike necrosis, apoptosis produces cell fragments called apoptotic bodies that phagocytic cells are able to engulf and quickly remove before the contents of the cell can spill out onto surrounding cells and cause damage. But many cells, can avoid this natural pathway and keep on proliferating, growing… CAN YOU REMEMBER SOMETHING LIKE THIS? YEAP, CANCER…. Cancer cells have the skill to runaway from apoptosis. One of the main «roads» to follow it is a pathway called: The Akt/PKB signaling pathway. Akt/PKB is a pathway in cell signaling. Proteins involved include AKT (also known as “protein kinase B”, PKB) and phosphoinositide 3-kinase (PI3K). As you can see on the picture, there are several molecules that naturaly follow some activating/inhibiting pathawys. This complex phosphorylates many highly significant substrates. Akt indirectly activates (not phosphorylates) mTOR, which lies at the heart of growth regulatory pathways. Akt also phosphorylates Bad (a pro-apoptotic protein,which in its non-phosphorylated state, promotes apoptosis) which sequesters it and keeps it out of action, promoting cell survival. Exercise training vs Muscle gaining and loss…. How can we built muscle? How do we lose it???? Looking into several degenerative muscular diseases ( Cancer, Diabetes, Heart Disease, Hypertension….) that will progressively deteriorate muscle and organs, whether due to lifestyle choices such as exercise or eating habits, it has been shown that exercise training exerts beneficial effects on skeletal muscle. Furthermore, it has been shown that the expression of myostatin, a key regulator of skeletal muscle mass, is increased in a variety of cachectic states. muscle wasting is a significante clinical problem. To address it more effectively, a thorough understanding of the underlying molecular pathways is crucial. WHAT CAN LEAD TO MUSCLE LOSS? In the picture we can see that Myostatin is recognize by membrane receptors, such as ActRIIB. But it can also be inhibited by other molecules such as Follistatin. Exercise training increases follistatin concentration in the blood and muscle is free to grow without myostatin inhibitor effect. Hard exercise training can increase follistatin in the blood above 50%. Why do Our tissues and organs stop to grow? From simple stem cells into different organs….. Animals have rapid body growth in early life stages, then the body impose limits to itself. From a single stem cell, several differente tissues (hearth, skin, eyes…) differentiate and acquire differente functions. WHY… What promotes differentiation? Stimulus or inhibitiors? Recent studies and (Julian C. et al, 2011) provide insight into a long-standing this mystery of biology. So until now, we know that here are several mechanisms involved. This mechanisms act locally and not in a systemic way. Of course that behind this control there is a genetic map where the inhibitor information is primarly imprinted. So there are several genes that are responsible for new proteins once expressed in tissues, limit the growth. In my study, i looked for hearth and muscle growth… Imagine that skeletal and cardiac muscle growth are negatively regulated by myostatin and the concentration depends on muscle mass itself. Liver growth appears to be modulated by bile acid flux, a parameter that reflects organ function. In pancreas, organ size appears to be limited by the initial number of progenitor cells, suggesting a mechanism based on cell-cycle counting. Further elucidation of the fundamental mechanisms suppressing juvenile growth is likely to yield important insights into the pathophysiology of childhood growth disorders and of the unrestrained growth of cancer. In addition, improved understanding of these growth-suppressing mechanisms may someday allow their therapy. Growth-suppressing mechanisms may someday allow their therapeutic suspension. Maybe, in HAP we will be able to stop Smooth muscle cells to proliferate in vessels. Changes in blood vessel diameter can stop blood flow… What controls it? In smooth muscle cell, there are key mediators of the proliferative effect… so the vessel has several walls that can proliferate without any control. Several substances stimulate smooth muscle cell growth and induces oxidative stress. Oxidative stress is a specific cellular crisis, that can disturb normal cell rules. Oxidative stress is started by ROS (reactive oxigen species). When intracellular ROS production in endothelial cells increases, smooth muscle starts to proliferate. Other factors are related with this proliferation: MMP (matrix metalloproteinases). MMP are capable of degrading all kinds of extracellular matrix proteins associated with smooth muscle matrix cell proliferation and migration. MMP is expressed abundantly in atherosclerotic lesions and plays an important role in increasing VSMC (vessel smooth muscle cells). MMP react with inter cell matrix allowing individual cell migration. SO… ROS allow proliferation while MMP allow migration…. we can say that «CAOS» BEGAN… Lúmen vessel get smaller and blood find a big obstacle to his passage. In summary, the proliferative effects of ET-1 (endothelial cells) involves an increase in the production of ROS. Further study of the signaling pathways involved may identify additional points at which ET-1-induced proliferation can be inhibited. Because antioxidants and other these agents may be of benefit in preventing the SMC proliferation associated with pulmonary vascular diseases. 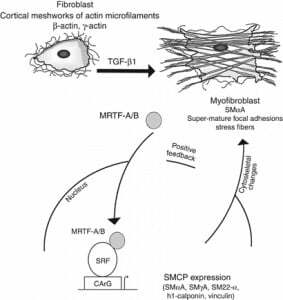 The fibroblast (immature cell)when exposed to a Growth factor (TGF-β1) increases assembly of a muscle filament called F-actin, inducing the myocardin-related transcription factor (MRTF)-A/B to go into the nucleus. After enter the nucleos, MRTF binds to serum response factor (SRF), and promote expression of a contractile gene program…. Program? yes, a group of other proteins tha regulate gene cell muscle differentiation. This group is called CArG-containing genes and the members are α-actin (SMαA), SMγA, SM22-α, h1-calponin, and vinculin. The expression of these genes causes changes to the cytoskeleton, resulting in differentiation of the myofibroblast and the development of contractile function…. so this is another way to keep studying how smooth muscle proliferates in lung vessels… is essencial to understand how this happens to keep looking for a therapy to hypertension. So, what is pulmonary hypertension (PH) is an increase in blood pressure in the pulmonary artery, pulmonary vein, or pulmonary capillaries, together known as the lung vasculature, leading to shortness of breath, dizziness, fainting, and other symptoms, all of which are exacerbated by exertion. Pulmonary hypertension can be a severe disease with a markedly decreased exercise tolerance and heart failure….. So we need to find where it starts the problem: AT THE VESSELS..AT THE SMOOTH MUSCLE. 1)WHAT REGULATES SMOOTH MUSCLE DIFFERENTIATION, REPAIR AND REMODELING?RESPONSE: MANY PROTEINS AND MOLECULAR PATHWAYS. 2)IS THERE A RELEVANT PROTEIN THAT WE CAN STUDY???? RESPONSE: YES THERE IS, MYOCARDIN. RESPONSE: MYOCARDIN IS A MASTER REGULATOR OF SMOOTH MUSCLE GENE EXPRESSION AND EXPLAINS HOW SRF (SERUM RESPONSE FACTOR) CONVEYS SMOOTH MUSCLE SPECIFICITY TO ITS TARGET GENES. 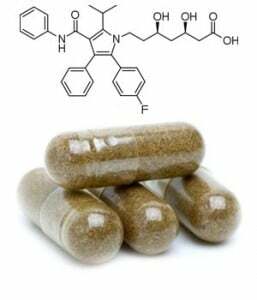 Jingjing Li and his team at The University of Calgary in Canada (2012 article), showed recently that myostatin can be inhibited by Atorvastatin (ATV), an inhibitor of 3-hydroxy-3-methylglutaryl-coenzyme A reductase, is widely prescribed as a lipid-lowering drug. So… now, we know that, a cholesterol drug can inhibit smooth muscle proliferation. But is that a role to PAH???? Is aplicable to PAH? My study will try to focus on Myocardin and Myostatin expression in smooth muscle. Next post, i will descrive how i am thinking to test this two protein expressions…. Pulmonary arterial hypertension (PAH) is characterized by widespread obstruction and obliteration of the smallest pulmonary arteries. When a sufficient number of vessels are occluded, the resistance to blood flow through the lungs increases, and the right ventricle attempts to compensate by generating higher pressure to maintain pulmonary blood flow. Myostatin is a protein that regulates both muscle mass and muscle metabolism. The myostatin null mouse has a hypermuscular phenotype owing to both hypertrophy and hyperplasia of the myofibres. Cardiac myostatin acts in an endocrine fashion to communicate to skeletal muscle and induce atrophy. Here, we aimed to identify key changes in the muscle phenotype, explore the expression, actions, specific signalling pathways and regulation of myostatin in smooth muscle (vessels).